Nice! Love the rear shots! Will be interested to hear about your first CL experience getting them on/off. 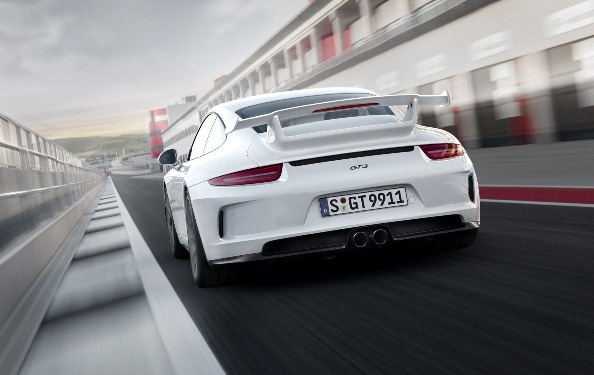 Any idea if the solo DL can connect to the 991 GT3 ECU via canbus yet? The CAN lines get you many more channels at a higher resolution. Please send me info on the Bypass as well - I get my car in February. I’m thinking about getting a Solo DL as well (and Smartycam HD). So it connected via OBDII and works in the GT3 no problem? Do you get throttle, Brake, RMP’s just by connecting via OBDII? Peter Kraus has details, but yes it can do the CAN. Seems to work ok via ODBII in mine, havent had time to look at the data yet though. Good suggestion, they are bloody awful!!! any tips on getting them off cleanly? FLM911. Im almost finished my 3500km European tour in the GT3. My car is white too. I will remove the Porsche lettering as soon as the car arrives in m home country. I also want to remove the red reflectors (or paint them white or use a vinyl skin). Please keep us updated on what you do. Im sure soon someone will make a white aftermarket reflector version. easiest way to remove any decal is low to med heat from a hair dryer & your finger nail or plastic scraper (gently) to start. Use a lot of patience...but worth it! some Simple Green to remove the glue residue, then water. There are DIY instructions for removing the sun visor decals somewhere on Rennlist (or on 6speedonline). Get a bottle of 70% rubbing alcohol ($3.50 at Walmart). Fold a couple of paper towels into a rectangular pad (a little bigger than the decal) and wet the folded pad with alcohol. Without removing the visors, press the wet pad against the decal for a few minutes (one visor at a time). Pick at a corner of the decal until you can pull it, then slowly pull the decal off. Clean off any remaining residue with alcohol, Simple Green, Goo-Gone, or Goof Off. Obviously, don't spill any of these liquids in your car. I use denatured alcohol, but those sound like suggestions I posted before so we're thinking alike. Just don't get any solvent on the vanity mirror hinges as they use a glue to hold them in place. Also, it helps to remove the visors from the car as it's much easier to work on them. As you begin to peel the sticker off, "paint" the contact line between the sticker and visor with solvent using a Q tip to break the grip of the adhesive. Peel slowly and carefully and the sticker will come off in one piece.